Ms Lowne’s second collection of poetry is as unconventional as the first. No sestinas, haiku or sonnets here, but a collection of down-to-earth, gritty, humorous (and sometimes not so funny) snippets of observation and situation. In short, Thusly contains everything you need to know about life and the universe, summed up neatly and alphabetically, in Lowne’s now trademark one-word titles. Hitting the shelves at the recession-busting price of just £4.99, `Thusly’ is without doubt the literary bargain of the year. 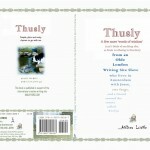 Spanning the alphabet from A to Z, `Thusly’ brings together a collection of poems that can’t fail to entertain. And there is something here for everyone.